The debate over snowmobile access in the Tahoe National Forest has turned ugly. Emails, social media posts and online comments with foul and abusive language prompted Forest Service officials to disable a portion of an online comment system, the Reno Gazette-Journal reported last week. 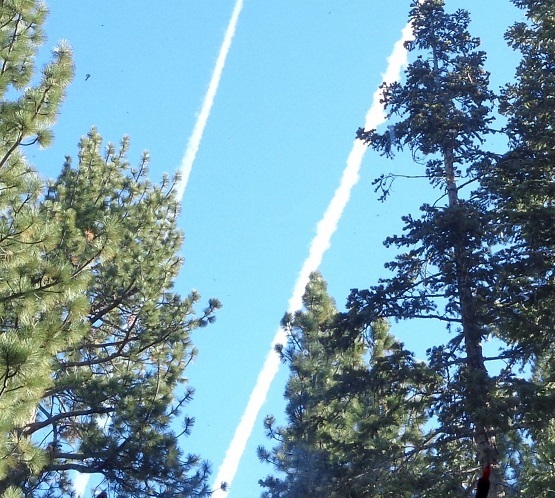 Tahoe National Forest Supervisor Eli Ilano said he has never seen anything like this. "It is discouraging because it is not promoting public discourse on the topic," he said. Supporters of the proposal pushing for more restrictions in the 1,250-square-mile (3,238-square-kilometer) area have been the targets of the online abuse, including anti-gay slurs, foul language and references to violence. Much of the acreage that would be off-limits to snowmobiles in the preferred alternative, for example, is below 5,000 feet (1,524 meters) in elevation and often lacks the snow depth needed to operate the machines. If you have thought about keeping bees at high altitude you are on a beautiful, exciting, and at times challenging journey. Honey bees are remarkable little helpers who require looking after like any other domesticated animal. Being a beekeeper requires commitment and care; in exchange you will be blessed with joy, excitement, and an often mystical experience. You are invited to witness a world of wonder, a harmonious rhythm between bees and vegetation, allowing you to feel more connected to and part of this amazingly connected ecosphere. Keeping bees at 8,600 feet, in a cold climate, you need to be aware of a few things to make your bees happy and keep them alive. You have to make sure that your bees have enough food at all times. This might involve carrying your hives to another area which grows certain crops you would like the bees to take advantage off. During the summer months you want to check on your bees weekly to make sure the hive is disease free, to control swarming, and to make sure your bees are happy and healthy. Anybody Keeping Bees in Lake Tahoe/Sierras? Thinking about taking 20 or so colonies up to Tahoe around the beginning of June. I am down in the SF Bay Area, and my nectar flow will end right around there. My thought was maybe I could put on a summer crop in the higher elevations. I've got some land near Sierraville that borders on grasslands vs where the mountains meet. I would think it would be decent forage, but wondering about my timing. Looking for first hand experience for the Tahoe/Sierra region. Elevation sits right around 5000ft, and yes, I am already looking into bear fencing + strobe alarms too? I don't want any part of that. Thanks. Re: Anybody Keeping Bees in Lake Tahoe/Sierras? I live in Plumas county at the North end of the Sierra's. Where I'm at(3,500 feet) the commercial bee keepers start moving there hives here right around now. The bears will destroy your hives,(raccoon's can be a problem too) so do plan on an electric fence. Good luck, there is a lot of alfalfa and wild flowers in Sierra valley. LAMAR COUNTY, Texas (CBSDFW) ? A semi-trailer truck carrying a reported 15-30 million honeybees overturned on an East Texas highway on Memorial Day. It happened on southeast Loop 286 near the Old Clarksville Road intersection in Paris, Texas. One witness said as her truck approached the scene, hundreds of bees buzzed around the vehicle. Multiple agencies came out to help redirect traffic from the area and clear the road of the bee boxes that fell from the truck. Local beekeepers were called in to help move the bees to a safer location and try to redirect the bees back into their hives, according to KXII-TV. They plan to move a queen in to try to attract more bees back to the hive for removal. Bee `s, where would we be without them? Most people think of bees as on a par with mosquitoes, pesky critters that bite and that all they`re good for is making honey. Tthe truth, they don`t need us, we need them. I am a beekeeper and they are difficult enough to keep; with all the chemicals they are spraying everywhere makes it even worse. But let me tell you something I have not heard from anywhere; it's the wild bees, we have a large amount of wild current tree (more like a bush but some are big like trees) and for some reason they are pollinated by chiefly the wild bees (for some reason the domestic bees rarely pollinate them) during the flowering the current trees are buzzing loudly, I mean scary loud, you literally walk around them give them extra space, but this year the amount of wild bees are I would say are down 90%, and that's really scary, I'm a bit concern. Scientists map where wild bees are disappearing in the U.S., and make a disturbing discovery. The buzzing insects are crucial pollinators for many agricultural crops, from pumpkins and squashes to peaches and apples. It turns out, however, that wild bee populations are on the decline in some of the main U.S. farmlands that need them the most. A team of researchers across the country identified these at-risk regions this month in the first national map of dwindling bee populations, which was published Tuesday in the Proceedings of the National Academy of Sciences. HuffPost Science recently posed a series of questions about wild bee populations and why we should be concerned to Dr. Insu Koh, a post-doc research associate at the University of Vermont who led the team. What follows is a lightly edited version of our discussion. New research identifies 139 counties in key agricultural regions of California, the Pacific Northwest, the Midwest, west Texas and the Mississippi River valley facing wild bee declines. Your research showed that populations of wild bees have declined significantly since 2008 in many of the nation?s key agricultural areas. Where was the decline most severe? We identified 139 counties in key agricultural areas, including California Central Valley, the Pacific Northwest and the upper Midwest, that are suffering from wild bee population decline and high demand of crop pollination. I made an app to show where these mismatches are currently. Bee populations have long been known to be in decline. Was there anything surprising in your finding? Now we have a map of the hotspots. It?s the first national portrait of pollinator status and impacts in the U.S. This study highlighted that this decline occurs in agriculturally intensive areas, rather than natural areas. These areas are also the most important areas for U.S. agricultural production, comprising 39 percent of the U.S. cropland. Surprisingly, the study suggests some of the crops most dependent on pollinators ? including pumpkins, watermelons, pears, peaches, plums, apples and blueberries ? have the strongest pollination mismatch, with a simultaneous drop in wild bee supply and increase in pollination demand. How many wild bees are there now in the U.S.? And how about domesticated bees? There are more than 4,000 bee species in the U.S. The primary domesticated bee is the honeybee, which is typically imported from outside the U.S. There are a very small number of domesticated native bees, such as blue orchard bees and leaf cutter bees. (AP, Kelsey K. Graham, Michigan State University, THE CONVERSATION) - Declines in bee populations around the world have been widely reported over the past several decades. Much attention has focused on honey bees, which commercial beekeepers transport all over the United States to pollinate crops. However, while honey bees are a vital part of our agricultural system, they are generally considered the chickens of the bee world ? domesticated and highly managed for specific agricultural use. They are not native to North America and often can?t be used as a surrogate for understanding what is happening with native wild bees ? the focus of my research. There are about 5,000 native bee species in North America. Many have shown no evidence of decline, and some are thriving in highly urbanized areas. But other species, including some that were previously common, are becoming harder and harder to find. As scientists work to understand bee decline, it is important to identify the unique roles that native bees play, and to identify threats specific to them. Wild bees have a unique way of extracting pollen from flowers called ?buzz pollination.? By shaking flowers at a certain frequency, more pollen will be released, thus allowing for more efficient pollination. Honey bees can?t do this. Bumble bees are particularly good at buzz pollination, so several species are now commercially managed. Increasing numbers of farmers who grow fruits, vegetables, tree nuts and flowers are now using either bumble bees alone or a mix of bumble bees and honey bees to pollinate their crops. But some bumble bee species are in decline. The rusty patched bumble bee (Bombus affinis) once was distributed throughout the eastern United States and southeastern Canada, but now is found only in a few small populations in the Midwest. In March 2017, it became the first bee in the lower 48 states to be listed as an endangered species after its population shrank by an estimated 91 percent in 20 years. Other bumble bees, such as the American bumble bee (B. pensylvanicus) have declined more gradually. There are 46 species of bumble bee in North America; the other native bees (4,954-plus species) are vastly different in size, colorand life history traits. Because native bees are so diverse, it is hard to identify a primary cause for wild bee decline. But as with bumble bees, poor nutrition and pesticide exposure are likely culprits. We also know that the majority of native bees nest in the ground, so they are vulnerable when natural areas are converted to tilled agricultural fields or paved over. Providing safe nesting areas for native bees is therefore vitally important to their conservation. Wild Bees Decline In U.S. Estimates of wild bee populations fell in 23% of the contiguous U.S. from 2008 to 2013, according to a new national assessment of the status and trends of wild bees (Proc. Natl. Acad. Sci. USA 2015, DOI: 10.1073/pnas.1517685113). The project, funded by the Department of Agriculture?s Specialty Crop Research Initiative, shows that at the same time wild bee populations are decreasing, demand for crop pollination is increasing. I have to believe the chem trailing is the problem. Beekeepers in the U.S. and elsewhere reported an increase in honeybee deaths over the last year, possibly the result of erratic weather patterns brought on by a changing climate. Insects around the world are in a crisis, according to a small but growing number of long-term studies showing dramatic declines in invertebrate populations. A new report suggests that the problem is more widespread than scientists realized. Huge numbers of bugs have been lost in a pristine national forest in Puerto Rico, the study found, and the forest's insect-eating animals have gone missing, too. The timber companies decided to replace grazing animals with pesticides to remove unwanted grasses for their timber production. As the rains carried herbicides and pesticides down the mountain and into the Kiamitchi River, the earth wept. Lack of forage, due to the aerial sprays, decimated wildlife populations and caused many of these persecuted ponies to have fetal abortions. Bryant Rickman set corrals throughout the forest and waited ? rescuing every horse off the mountain. Because oxygen isotope data are used to establish these periods of warmer or colder temperature, the sequence is referred to as the Marine Isotope Stage (MIS) timescale, or alternatively as the Oxygen Isotope Stage (OIS) timescale. By convention, the warmer periods are assigned odd-numbered stages, starting with the Holocene (MIS 1), and the colder periods are assigned even-numbered stages, starting with the most recent glacial period (Wisconsin - MIS 2). The boundaries between cold and subsequent warm stages roughly correlate with glacial terminations, as delimited by an abrupt decrease in the oxygen isotope ratio indicating rapid ice sheet melting and deglaciation. Glacial terminations are indicated by Roman Numerals, starting with Termination I at the end of the most recent glaciation (Wisconsin period). CAMARILLO, Calif. ? The number of monarch butterflies turning up at California's overwintering sites has dropped by about 86 percent compared to only a year ago, according to the Xerces Society, which organizes a yearly count of the iconic creatures. That?s bad news for a species whose numbers have already declined an estimated 97 percent since the 1980s. Why Are So Many Earth Insects Dying? ?This Oct. 15th, 2018, PNAS report is one of the most disturbing articles I have ever read.?
? David Wagner, Ph.D., Prof. of Ecology, Univ. of Connecticut. ?If all humankind were to disappear, the world would regenerate back to the rich state of equilibrium that existed 10,000 years ago. If insects were to vanish, the environment would collapse into chaos.? December 30, 2018 Storrs, Connecticut ? A recent news headline from the School of Biological Sciences at Rensselaer Polytechnic Institute in Troy, New York, says it all: ?Two Degrees Decimated Puerto Rico?s Insect Populations.? So, what is killing all those insects? Scientists think a lot of the damage is due to global warming. Here is one astonishing fact. The average temperature in northeastern Puerto Rico tropical forests since the 1970s has steadily climbed and is now 2 degrees Celsius warmer. That?s a climb of 3.6 degrees Fahrenheit. Those sound like small numbers, but the fragile balance of nature on our planet lives within narrow temperature ranges. Biologists from Rensselaer decided to study insects in a place on Earth not much bothered by humans. They chose the Luquillo forest of northeastern Puerto Rico to see what was happening to the populations of winged insects called arthropods. Think of butterflies, dragonflies, grasshoppers, moths, spiders and beetles. It?s as if the insects are now like the canary in the coal mine, sending us warnings that something is very wrong. The United Nations Intergovernmental Panel On Climate Change (IPCC) has been warning of severe environmental threats to our entire planet if there is a 2- degrees Celsius elevation in average global temperature. Like some other tropical locations, the study area in the Luquillo forest, has already reached or exceeded a 2-degree Celsius average rise in temperature. And the study warns that the consequences are ?potentially catastrophic.? They arrive in California each winter, an undulating ribbon of orange and black. There, migrating western monarch butterflies nestle among the state?s coastal forests, traveling from as far away as Idaho and Utah only to return home in the spring. This year, though, the monarchs? flight seems more perilous than ever. The Xerces Society for Invertebrate Conservation, a nonprofit group that conducts a yearly census of the western monarch, said the population reached historic lows in 2018, an estimated 86 percent decline from the previous year. That in itself would be troubling news. But, combined with a 97 percent decline in the total population since the 1980s, this year?s count is ?potentially catastrophic,? according to the biologist Emma Pelton. ?We think this is a huge wake-up call,? said Ms. Pelton, who oversees the survey and lives in Portland, Ore. The USDA has been under fire recently for its admitted assault against nature, after multiple investigations have uncovered its deliberate tampering with both plants and animals alike. One such investigation has put an end to the mystery surrounding the death of millions of birds, with USDA documents revealing the organizationâ€™s role in the massive slaughter. In addition to the mass bird killings, it turns out the USDA was fully aware that a highly-popular herbicide chemical was a known bee-killer, which may have aided the bee decline. The USDA has also threatened the genetic integrity of the nationâ€™s crops. Information has surfaced regarding the USDAâ€™s illegal approval of Monsantoâ€™s biotech crop, sugar beets. These crimes are simply an excerpt from the long list of USDA crimes that are continually being exposed. In December of 2010, mystery struck the world. Reports of mass fish and bird die-offs were coming in from Texas to Sweden. The first occurrence in the series of strange events started in Arkansas, where 3,000 birds fell from the sky. In the following days and weeks, similar incidents were reported with no solid explanation. The reason has now been found, thanks to documents found on the USDAâ€™s website. Claiming to be protecting farmers from predators, the birds were victims of a little-known government program. Like millions of other animals since the Bye Bye Blackbird program was created in the 1960?s, the birds were poisoned and killed for being considered a nuisance to farmers. It is important to take note that many of these animals donâ€™t pose any immediate threat to farmers. Insect populations are declining dramatically in many parts of the world, recent studies show. Researchers say various factors, from monoculture farming to habitat loss, are to blame for the plight of insects, which are essential to agriculture and ecosystems. On three occasions from 1989 to 2014, entomologists set up tents in the meadows and woodlands of the Orbroicher Bruch nature reserve and 87 other areas in the western German state of North Rhine-Westphalia. The tents act as insect traps and enable the scientists to calculate how many bugs live in an area over a full summer period. Recently, researchers presented the results of their work to parliamentarians from the German Bundestag, and the findings were alarming: The average biomass of insects caught between May and October has steadily decreased from 1.6 kilograms (3.5 pounds) per trap in 1989 to just 300 grams (10.6 ounces) in 2014. ?The decline is dramatic and depressing and it affects all kinds of insects, including butterflies, wild bees, and hoverflies,? says Martin Sorg, an entomologist from the Krefeld Entomological Association involved in running the monitoring project. Declines in insect populations are hardly limited to Germany. A 2014 study in Science documented a steep drop in insect and invertebrate populations worldwide. By combining data from the few comprehensive studies that exist, lead author Rodolfo Dirzo, an ecologist at Stanford University, developed a global index for invertebrate abundance that showed a 45 percent decline over the last four decades. Dirzo points out that out of 3,623 terrestrial invertebrate species on the International Union for Conservation of Nature [IUCN] Red List, 42 percent are classified as threatened with extinction. ?Although invertebrates are the least well-evaluated faunal groups within the IUCN database, the available information suggests a dire situation in many parts of the world,? says Dirzo. Around the globe, scientists are getting hints that all is not well in the world of insects. Increasingly, reports are trickling in of unsettling changes in populations of not only butterflies and bees, but of far less charismatic bugs and beetles as well. Most recently, a research team from the U.S. and Mexico reported a startling decline between 1976 and 2013 in the weight of insects and other arthropods collected at select sites in Puerto Rico. Some have called the apparent trend an insect Armageddon. Although the picture is not in crisp enough focus yet to say if that?s hyperbolic, enough is clear to compel many to call for full-scale efforts to learn more and act as appropriate. ?I would say the insect decline in biomass and diversity is real because we see things repeated across different sites across different groups,? says Weller. ?But is it an Armageddon? That part is more difficult to tease out.? ?We do know we have some declines, some very worrisome declines,? echoes David Wagner, professor of ecology and evolutionary biology at the University of Connecticut and author of a chapter on insect biodiversity trends in the 2018 Encyclopedia of the Anthropocene. ?The bigger question is, ?Why??? he says. ?And that?s so very important. You can?t fix something until you understand what the problem is.? ?It?s quite a mixed picture,? Leather says. ?Some insects do seem to be in trouble. Other insects aren?t.? ?We have estimates, but there hasn?t been a full assessment or even identification of all the insect species out there,? Spafford says. ?If a place has not been well studied over a long period of time, we don?t really have good data to be able to draw conclusions. ?